This species is easily diagnosable by its unique flank markings. Adult male from the European aquarium trade. Devario: appears to be derived from a local vernacular name for the type species of the genus Cyprinus (now Devario) devario Hamilton, 1822.
pathirana: named for Ananda Pathirana who made the authors aware of the new species. Known only from a series of small streams and tributaries exiting the Kanneliya Forest Reserve plus tributaries of the Opatha Ela (Opatha stream) near the village of the same name in southwestern Sri Lanka. Type locality is given as ‘ributary of Opatha Ela, descending from Kanneliya Forest Reserve to Opatha, 6°15’40″N, 80°23’45″E, Sri Lanka’. All known populations exist within the Nilwala River watershed, at least 70% of which is now cultivated and heavily mined for sand in some areas. These human activities have resulted in the removal of much of the original forest cover and degraded water quality to the extent that numerous native species are now considered at risk of extinction. The type locality was a low gradient stream flowing slowly over lateritic clay and in 1990 was between 4-8 m in width and up to 3 m deep, though along much of the sampled stretch average depth was just 10-150 cm. The substrate was composed of small, smooth, sandstone boulders interspersed with patches of sand or silt and the water very clear. Emerse vegetation consisted of Aponogeton and Lagenandra species while much of the surrounding land had been turned over to rice, tea or coconut plantations. D. pathirana was observed swimming in small groups in riffles, rapids and deeper pools with the authors noting it appeared to live a more sedentary lifestyle than the faster-swimming D. malabaricus which had been widely observed at other sites. Sympatric species included Puntius bimaculatus, P. kamalika (probable, identified as P. amphibius in 1990), P. vittatus, Pethia nigrofasciata, Dawksinia singhala (probable, identified as D. filamentosa in 1990), Systomus pleurotaenia, S. sarana, Rasboroides vaterifloris, Rasbora dandia (probable, identified as R. daniconius in 1990), Laubuca laubuca, Belontia signata, Awaous grammepomus, Sicyopus jonklaasi and Ompok ceylonensis (probable, identified as O. bimaculatus in 1990). A tank base measuring at least 120 ∗ 45 cm is suggested for long-term maintenance. Since it naturally occurs in pristine habitats it’s intolerant to accumulation of organic pollutants and requires more-or-less spotless water in order to thrive. Though very fast flow is unnecessary it also does best if there is a high proportion of dissolved oxygen and moderate water movement. Weekly water changes of 30-50% tank volume should be considered routine, and the tank must have a very tightly-fitting cover as all Devario spp. are accomplished jumpers. Not especially belligerent but can upset very slow-moving or shyer tankmates with its constant activity and vigorous feeding behaviour, and may nip trailing fins. It’s therefore only appropriate for larger tanks containing robust, similarly-sized tankmates. There are plenty of suitable choices including many cyprinids, loaches, cichlids, catfishes and characids although as always when selecting a compatible community of fish proper research is essential. It occurs in schools by nature so the purchase of a minimum 6-10 specimens is recommended since this will result in a more effective, natural looking display as well as help reduce any nervous behaviour and encouraging males to display their best colours. Further, this species is more combative than most members of the genus so maintaining it in decent numbers is useful because any aggressive interactions will normally be restricted to conspecifics, and the provision of multiple rivals should mean no single, weaker individual is harassed excessively. Sexually mature females are rounder-bellied, less colourful and a little larger than males. Like most small cyprinids Devario spp. are egg-scattering free spawners exhibiting no parental care. When in good condition they will spawn often and in a well-planted, mature aquarium it’s possible that small numbers of fry may start to appear without intervention. The adult group can still be conditioned together but a smaller tank with a base measuring around 45 cm x 30 cm should also be set up and filled with mature water. Alternatively filling much of the tank with a fine-leaved plant such as Taxiphyllum spp. or wool mops can also return decent results. When the adults are well-conditioned and the females appear gravid one or two pairs should then be introduced. If ready spawning usually taking place within 24 hours, with the female tending to appear noticeably slimmer after the event, and after 48 hours the adults should be removed whether this is observed or not. Incubation is temperature-dependant to an extent but typically lasts 24-36 hours with the young free-swimming a few days later. Initial food should be Paramecium or similar, introducing Artemia nauplii, microworm, powdered dry foods, etc., once the fry are large enough to accept them. Despite its endangered status in nature D. pathirana is bred commercially for the aquarium hobby, albeit in limited numbers, and is thus available on an irregular basis though it’s always expensive compared with the commoner Devario spp. It’s sometimes sold under the alternative names ‘tiger’ or ‘Ceylon’ danio. This species is diagnosable from other members of the genus primarily by its unique colour pattern which consists of 7-11 dark blue, irregularly-shaped, parallel vertical bars on the anterior portion of each flank plus a short horizontal stripe on the caudal peduncle which extends into the central caudal-fin rays. Phylogenetic analyses suggest it’s most closely-related to Indian Devario spp. plus D. xyrops from the western slope of the Rakhine Yoma mountains in Myanmar (Fang et al., 2009; Fang and Kullander, 2009). – P stripe: or ‘pigment stripe‘ is the central, dark, lateral stripe on the body which extends into the caudal-fin in some species. Stripes above it are numbered P+1, P+2, etc., and those beneath P-1, P-2, P-3. Following Fang (2003) Devario spp. are characterised by: possession of a P stripe extending onto the median caudal-fin rays; a short maxillary barbel (absent in some species); absence of the A stripe (a less distinct, relatively wide stripe is present in some species, e.g., D. acrostomus, D. annandalei, D. xyrops); a short, wide premaxillary process (cleft in the upper jaw) with a tiny apophysis (bony tubercule) touching the kinethmoid bone; infraorbital 5 not or slightly reduced. 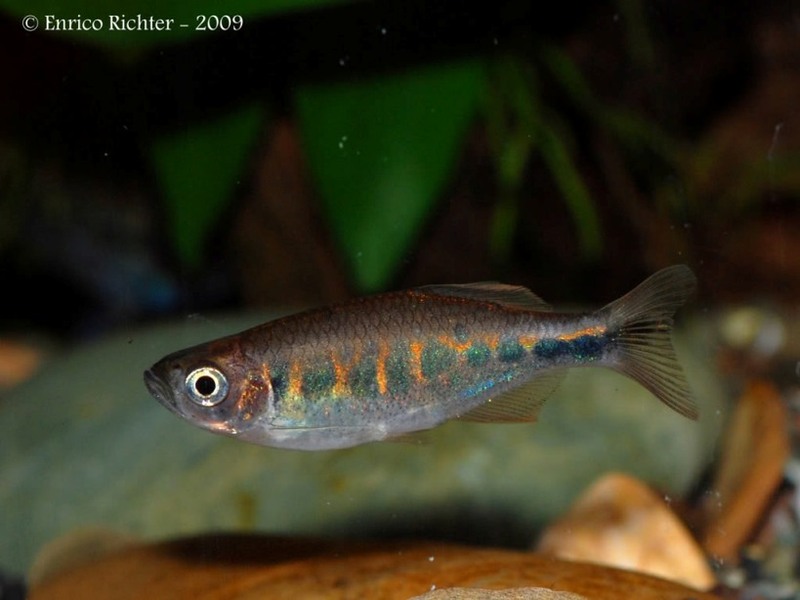 The current genus name has only been in general use since 2003 prior to which members were considered to belong to the genus Danio. Older, molecular, phylogenies tended to agree that the latter represented a monophyletic group consisting of two major clades; the ‘Danio devario‘ grouping containing the larger, deeper-bodied species and the ‘D. rerio‘ assemblage comprising the smaller, slimmer fish. However in 2003 Fang Fang conducted a more detailed study based on morphological characters which included members of other related genera, and the results suggested for the first time that the genus Danio as previously considered represents a polyphyletic grouping, i.e., not all members derived from a single common ancestor. 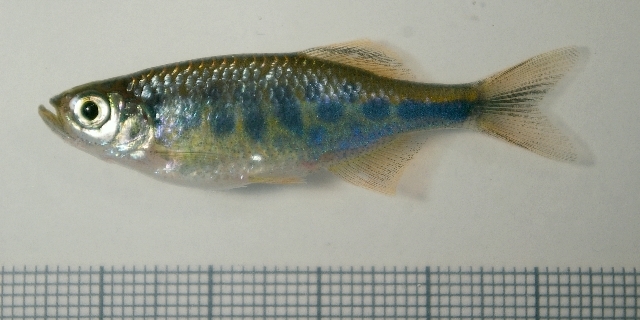 The genus name Devario was suggested for the larger species with Danio being applied only to the smaller fish, although following Kottelat (2013) the latter should be used only for the type species, Danio dangila, with most former members placed within the revalidated genera Brachydanio and Celestichthys. These results have largely been supported by subsequent phylogenetic analyses (e.g. Mayden et al., 2007), although Devario has still undergone a little reshuffling, particularly following Fang et al. (2009) and Kottelat (2013). In the former study the two species previously comprising the genus Inlecypris were brought into synonymy with Devario and three species formerly included in Microrasbora were moved into the new genus Microdevario based on possession of shared synapomorphies with Devario. The existence of a monophyletic clade consisting of the genera Devario, Chela, Laubuca, Microdevario and Microrasbora was also hypothesised, a theory upheld in the more recent study by Tang et al. (2010). The genus Betadevario (Pramod et al., 2010) is also nested within this grouping and is sister to Devario and Microrasbora. Kottelat (2013) revalidated the genus Inlecypris whilst noting that phylogenetic evidence suggests the existence of two genetic lineages within Devario. The first contains the species with prominent lateral stripes, which leaves the remaining members (D. apogon and D. chrysotaeniatus) of uncertain taxonomic placement. In addition, a number of the striped species share a colour pattern comprising a midlateral stripe on the posterior half of the body with a few bars in the anterior portion and golden patches between them. These may eventually be placed in a separate genus for which the name Parabarilius is available. Danio pathirana, a new species of cyprinid fish endemic to southern Sri Lanka. Betadevario ramachandrani a new danionine genus and species from the Western Ghats of India (Teleostei: Cyprinidae: Danioninae).